After conceding game one of the Western Conference Final to the Chicago Blackhawks by a score of 3-1 the Los Angeles Kings have won three straight. Even more alarming for the Blackhawks is he manner in which they are losing when they have allowed 15 goals in those three games. 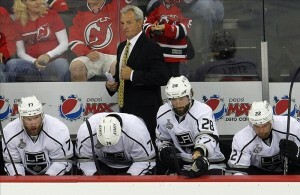 While the Los Angeles Kings have only allowed seven goals against. How are the Kings handling the high powered Chicago offense so well? 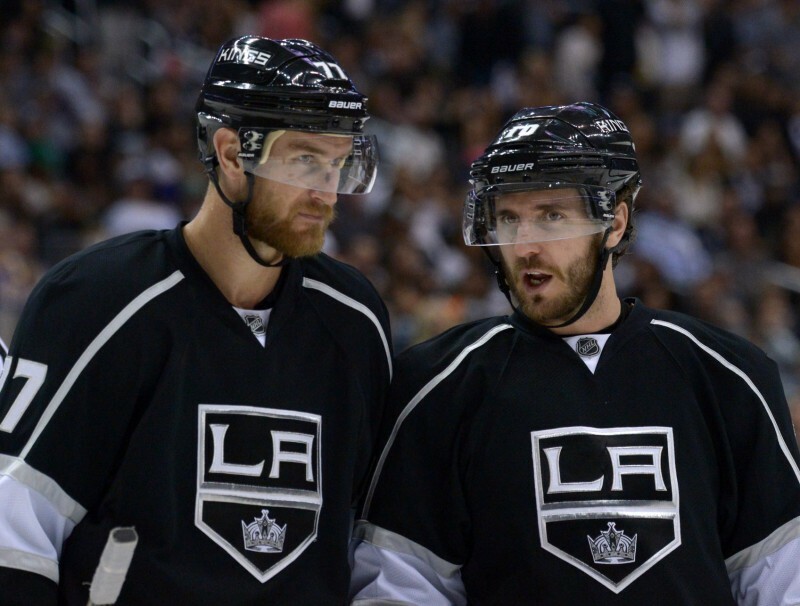 Los Angeles Kings assistant captain Mike Richards on where the series stands. The Los Angeles Kings are not thought to be as quick a team as the Chicago Blackhawks but they seem to be able to put them back on their heels in this series. 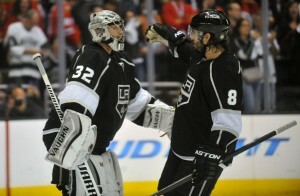 In game four it looked like Chicago could not keep up with the pace the Kings were setting. If there was a loose puck the Kings were first to it more often than not. Blackhawks forward Bryan Bickell’s thoughts. Are the Blackhawks simply out of gas after a long season and a Stanley Cup win in last year’s playoffs? Potentially yes, however they will need to dig down and find more jump in their tired legs. They can still make a series out of this if they can get back to playing their style of game and using their speed as the Kings have been. 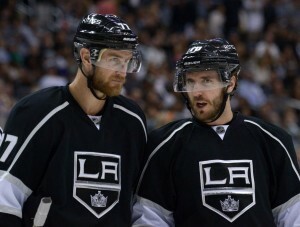 The Los Angeles Kings are well known as a physical two-way team that wears their opponents down with their size. The longer a series goes, generally, the bigger an advantage the Kings would have. In these playoffs the Kings have averaged 42 hits per game as compared to the Blackhawks at 22 hits per game. When watching the games it is clear that Brent Seabrook and Duncan Keith have not been paying up to their usual high standards. 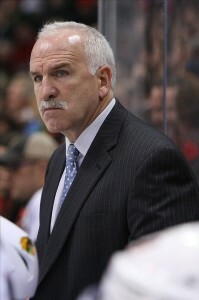 Head Coach Joel Quenneville on the defensive struggles thus far. Since the 2011-12 regular season Keith’s CORSI FOR percentage have never been below 52%, however in these playoffs he is down to 48.7% with a PDO of 105.0. 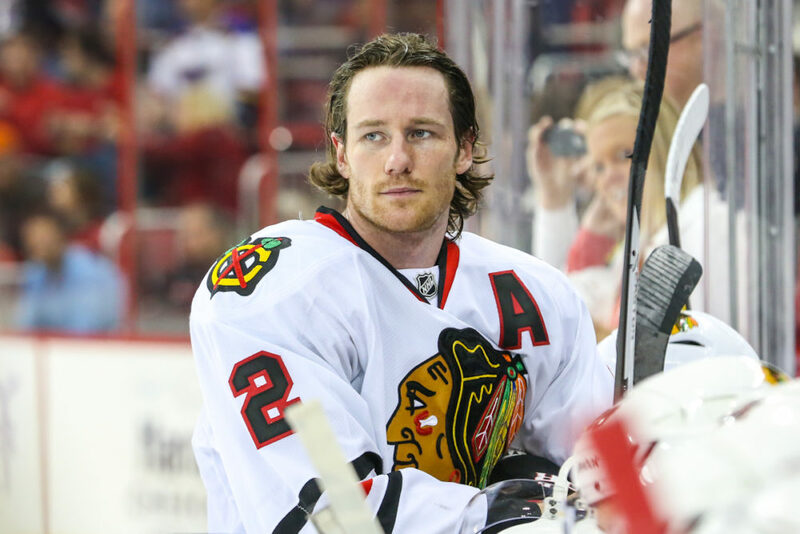 Duncan Keith has also been targeted heavily in the playoffs taking 49 hits against thus far, which is just over three per game. It is clear that these hits are making him rush his decisions as evidenced by his 23 giveaways through 16 games. Since 2011-12 he has averaged only 0.75 giveaways per game and in these playoffs he is at 1.4 per game, this is a large swing to the negative for Keith. Another thing that could be frustrating Duncan Keith to no end is the fact that over 52% of his attempted shots have been blocked prior to getting to the net. The majority of the time (74.7%) Seabrook is paired with Duncan Keith while on the ice. He too is having rough playoffs with a CORSI FOR, currently 47.6%, below 51% for the first time in the past three seasons. Like Keith, his PDO is also on the higher end at 103.1, which indicates to me that Keith and Seabrook are being bailed out by their forwards and goaltender more often than the other way around in these playoffs. Seabrook is also having the same difficulties as Keith in terms of giveaways. Prior to these playoffs Seabrook averaged 0.79 giveaways per game and in the playoffs he has averaged one per game this year. Seabrook has this to say. Through the first four games the Chicago Blackhawks and the Los Angeles Kings are mostly even in terms of the traditional CORSI (+2.3 for Chicago) and FENWICK (+0.3 for Los Angeles) stats. As CORSI includes blocked shots it appears that the Kings are doing an excellent job getting in front of pucks and not allowing them to get to Jonathan Quick. The Kings are also outshooting the Blackhawks but +3.2 shots per 60 minutes of five on five. Even more telling is the PDO for the Kings being 102.6 and the Blackhawks at 97.4. The Blackhawks have not performed well in five on five situations with only an 89.7% save percentage when compared to the Kings at 92.2% save percentage. The area of the game that the Kings are dominating the most is when they are up by one goal. They have a CORSI differential of +14 per 60 minutes and FENWICK differential of +21 per 60 minutes to go along with outshooting Chicago by 14 shots per 60 minutes. Quenneville’s thoughts on playing with a lead. The Kings are also doing a great job of adding to their leads with a 27.3% shooting percentage when they are up by one goal. As a result Chicago is struggling to keep games close with a 72.7% save percentage when the Blackhawks are down by one goal. Compared to Chicago the Kings are doing a very good job of pushing back when they are down by a goal. Their CORSI differential in that situation is +7 per 60 minutes with FENWICK differential of +4 per 60 minutes and outshooting the Blackhawks by 6 shots per 60 minutes. They will need to stay disciplined and not give the Blackhawks a chance to make their power play a factor in the series. If the Kings can maintain their physical presence while continuing to out battle the Blackhawks speed this series could be over quickly. However with the experience in Chicago’s locker room I highly doubt we will not see a push back in game five. As well when you look at the CORSI, FENWICK, Shots for and shooting percentage an alarming trend can be seen. The Blackhawks were scoring at a 9.6% rate through the regular season and 10.7% during the playoffs. So far in the Conference Finals with the Kings they are scoring at a 10.4% rate. However their team save percentage during the series of just 85.5% is due for a bounce back. Joel Quenneville’s thoughts on games three and four. 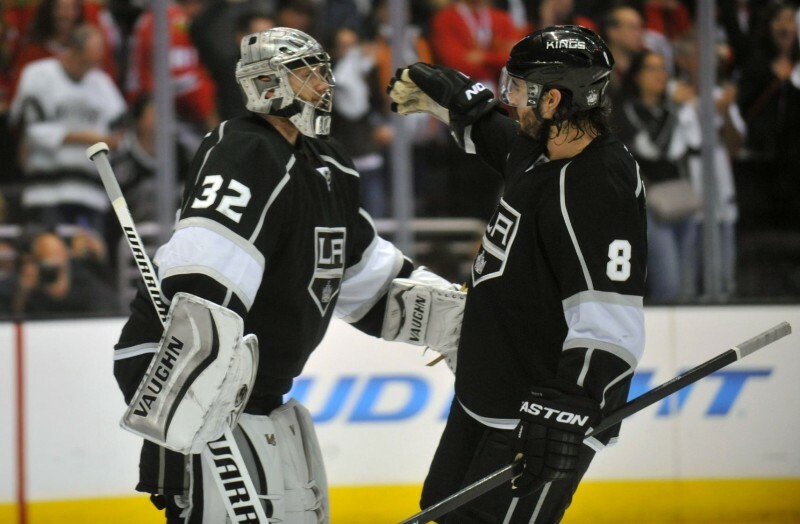 Are the Kings ready to stick a fork in the Blackhawks? 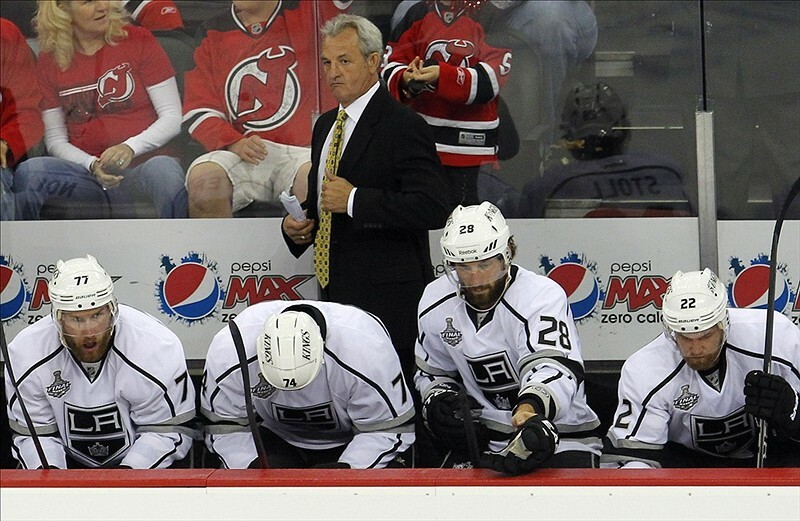 Kings Coach Darryl Sutter on game five. Based on the trends shown of Chicago beginning to take more control of the games and the Kings shooting percentage being due for a regression I expect the Blackhawks to win at home in the Madhouse on Madison in game five. Also based on these trends do not be surprised to see the Chicago Blackhawks back on home ice in game seven with a chance to go to the Stanley Cup final. Everyone is ready to anoint the Kings but the Blackhawks are not done yet and are excited to start game five as per Coach Joel Quenneville. Advanced statistics from The Extra Skater and all quotes from NHL post game and off day interviews.